Simeiz Observatory (also spelled Simeis or Simeïs) was an astronomy research observatory until the mid-1950s. It is located on Mount Koshka, Crimea, Disputed between Russia and Ukraine by the town of Simeiz. Part of the Crimean Astrophysical Observatory, it is currently used for laser based studies of the orbits of satellites. The Minor Planet Center (MPC) credits Simeiz Observatory as the location where a total of 150 minor planets were discovered by astronomers Grigory Neujmin, Sergey Belyavsky, Vladimir Albitsky, Grigory Shajn, Nikolaj Ivanov, Pelageya Shajn, Praskov'ja Parchomenko, Alexander Deutsch and Evgenij Skvorcov. As of 2017, the discovery of the minor planet (369010) 2007 OK2 is directly credited to Simeiz Observatory by the MPC. Radiotelescope RT-22 of the Simeiz Observatory. Simeiz observatory organized by an amateur astronomer and later Honored member of the Academy of Science, M. Maltsov. In 1900 he built a tower for refractor at his land plot near Simeiz. In 1906 – a tower with dome for Zeiss double astrograph. Both towers are preserved and being used nowadays. In 1908, M. Maltsov handed his observatory to Pulkovo observatory as a present. In 1912, the first astrophysical department of Pulkovo observatory was officially opened at the south of Russia. Simeiz observatory is situated at the level of 360m above sea level at southern mountainside of the Crimean mountains, at Koshka mountain. A main building was restored after the Second World War on the basis of old building in modernized style with balconies decorated by columns. Research of interstellar space and star formation zones, discovery of star rotation, creation of stellar catalogues of radial velocities, study of chemical composition of stars and the Sun brought the world publicity to Simeiz observatory. The results of research of stars and the Sun represents an independent value. 1. Very Long Baseline Interferometry (VLBI). 2. Multi-wavelength monitoring of Active Galactic Nuclei (AGN). 3. Solar and stellar activity investigations. 4. Molecular lines observations at mm wavelengths. Minor planets, whose discovery is directly credited to the observatory (rather than a particular astronomer). 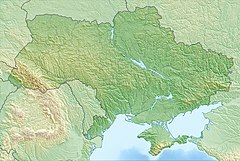 ^ This place is located on the Crimean peninsula, most of which is the subject of a territorial dispute between Russia and Ukraine. According to the political division of Russia, there are federal subjects of the Russian Federation (the Republic of Crimea and the federal city of Sevastopol) located on the peninsula. According to the administrative-territorial division of Ukraine, there are the Ukrainian divisions (the Autonomous Republic of Crimea and the city with special status of Sevastopol) located on the peninsula. ^ a b c "Minor Planet Discoverers (by number)". Minor Planet Center. 4 September 2016. Retrieved 27 December 2016. Crimean Astrophysical Observatory Detailed History of Simeiz and Crimean Astrophysical Observatory(in Russian). This page was last edited on 12 December 2018, at 16:30 (UTC).